The Marvel Adventures line, intended for a younger audience, focuses on standalone stories, simple themes and its own loose brand of continuity. 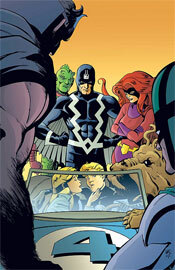 MA: Fantastic Four, for instance, this month spotlights the team’s first encounter with the royal family of Inhumans. It’s a nice concept: introduce kids to the characters before you overwhelm them with forty years of back stories and chase them away. Fred Van Lente aims to bring a light, humorous air to the book, but ultimately doesn’t seem all that comfortable with the format. Each of his characters are spoiling for a fight above all else, whether they’re hero or villain. The primary focus of the story is on the quirks and absurdities of life as a superhuman, but he never delves too deeply into the concept. It’s basically fifteen pages of the heroes calling each other weirdos and shifting their eyes around, with a few random acts of violence thrown in. Everybody gets a chance to show off their powers and grimace, and the problem is solved tidily at the end of the day. Cory Hamscher’s art is extremely inconsistent – he’ll knock your socks off with a great illustration on the left side of a spread and mail in his contribution to the right. His work is excessively cartoonish with a heavy manga influence, often to a fault. While he retains much of the flair and excitement of the style’s action sequences, he also carries over an excess of its clichés and stereotypes. Every single female character has gargantuan bug eyes, accompanied by teeny tiny miniscule necks. It’s cute once or twice, but when it’s overdone to this degree, it becomes really distracting and obnoxious. I realize that the goal is to bring something to the table that’s bright and flashy for the kids, but that doesn’t mean it can’t have substance, too. Hamscher also doesn’t seem to have much of a feel for these characters. Reed looks twice as old as he’d have been at the time of this story, (continuity or no, he wasn’t 50-something his entire life) while Black Bolt’s appearance hasn’t changed a bit. Sue is more of a brainless ditz in a dark dress than an intelligent, motherly type. The artist usually fills his backgrounds with needless speed lines or aimless crosshatch. Add to all that a paneling style that’s over the top, far too busy and tough to follow, and you’ve got a book that’s just a mess, visually. When he’s on, he really delivers, (as evidenced by the two or three really nice splash pages in this issue) but he isn’t ready for a gig as a regular artist yet. As the printed version of a Saturday morning cartoon, this is what you’d imagine it would be. Loud, overly stylized artwork, paired with a rudimentary, thin story. Reading this book is like eating popcorn: light and airy, but not quite enough for a full meal. It might reach its target audience on name value alone, but a younger crowd shouldn’t necessarily make for a weaker story. A great tale can entertain children and adults alike, which is a claim Marvel Adventures: Fanastic Four can’t quite make. I’d skip this one, even if you’re shopping for your kid brother. There’s much better kid-oriented material out there.